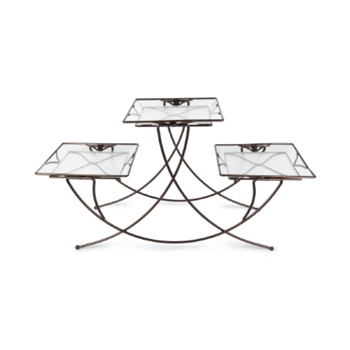 The Triple Square Plant Stand has a symmetry that makes decorating with plants easy. Square pots or round will look great in this stand. Snap-in saucers are included that protect floors from water damage allowing for indoor or outdoor use. Packaged in a full box, the assembly is simple. Dark Bronze finish, 23 x 10 x 15" assembled.